1924 Grand Prix Cars Portfolio by Geo Ham. 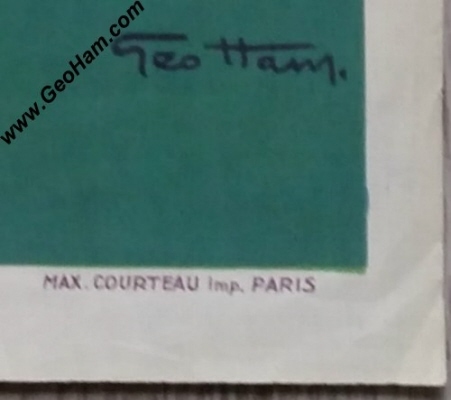 One of the earliest, if not THE earliest, published works of Geo Ham. Published by the Office Francais de Publicite. 1920's Dunlop Motorcycle Tires Advertising Poster. Measures approximately 80 x 120 cm. 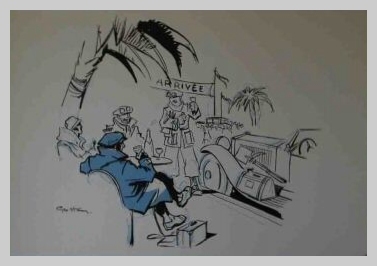 1920's Bugatti Illustration by Geo Ham. 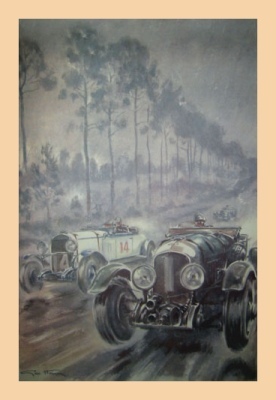 This illustration was made by Geo Ham as cover art for French magazin L'Illustration and depicts a Bugatti racing scene. This is a VERY large modern print of this illustration which was printed on very thick paper. It measures approximately 70 x 100 cm - 28 x 40 inches. 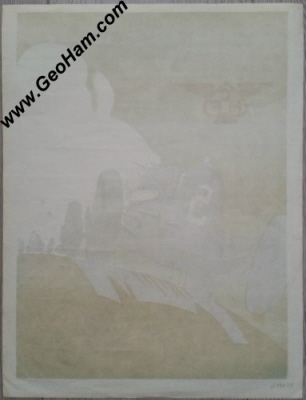 1920's ''Arrivee'' Litho of unknown desert race event. Measures approximately 35 x 30 cm. 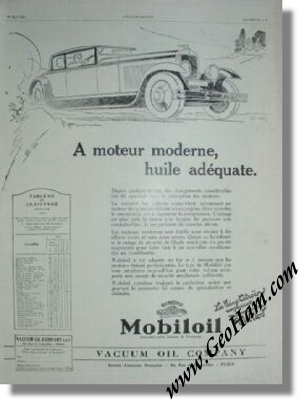 Vintage 1927 Mobiloil Advertisement by Geo Ham. Appeared in various French magazines in 1927. Measures approximately 38 x 28 cm - 15 x 11 inches. 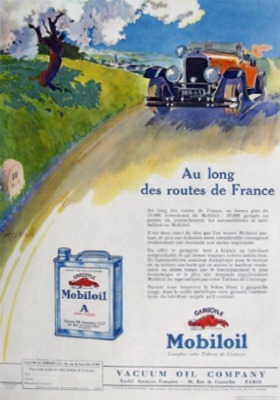 Advertisement for Mobil Oil, 1927. 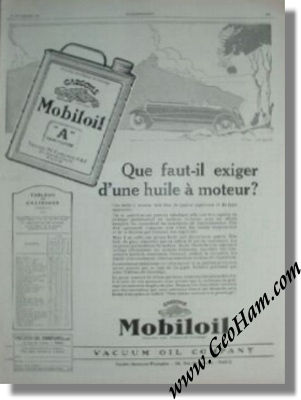 Vintage 1928 Mobiloil Advertisement by Geo Ham. Appeared in various French magazines in 1928. 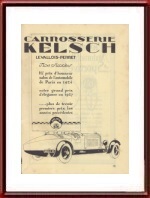 Art Deco Advertisement for Carrosserie Kelsh in Levallois-Perret, 1929. 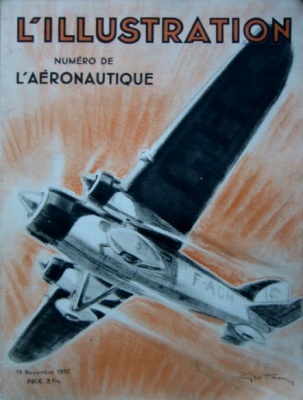 Appeared in the 1928 year book of the ACO and possibly other French publications. Appeared in various French magazines in 1929. Measures approximately 11 x 15 inches. 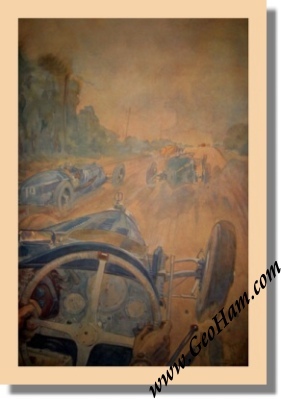 1929 Le Mans Illustration by Geo Ham. 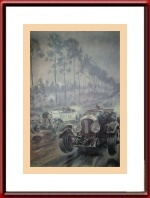 This illustration was made by Geo Ham as cover art for French magazin L'Illustration and depicts the winning # 1 Bentley Speed Six of Wolf Barnato and Tim Birkin overtaking the # 14 Chrysler 75 of Henri Stoffel and Robert Benoist during the 1929 running of the Le Mans 24 Hours. 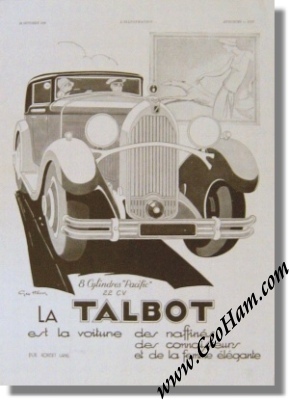 Vintage 1930 Talbot Advertisement by Geo Ham. 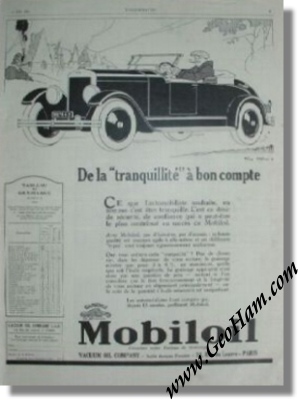 Appeared in various French magazines in 1930. 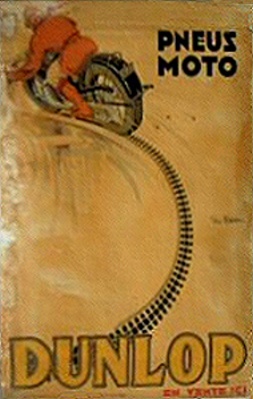 Cover art by Geo Ham. 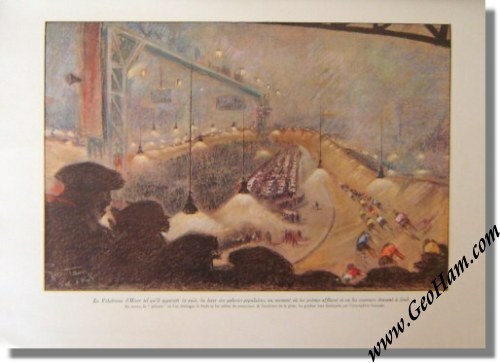 Vintage 1932 L Illustration 6 Days Paris Cycling Event Illustrations by Geo Ham. 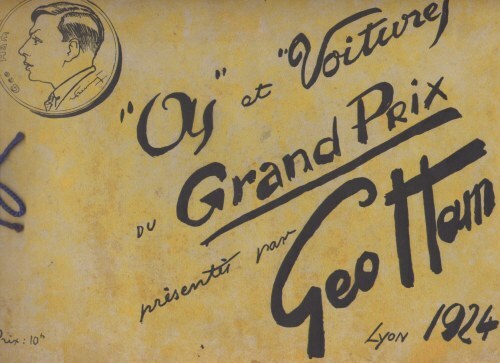 April 9, 1932 issue of French magazine L'Illustration, covering amongst other the 6 days Endurance cycling event in Paris. 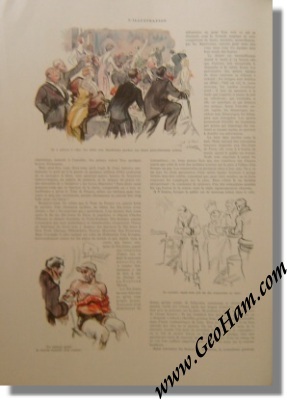 Contains 4 full page color drawings of the event by Geo Ham and many contemporary, art deco, advertisments. This concerns the full issue of this magazine which is in great condition. Each page measures approximately 38 x 28 cm - 15 x 11 inches. 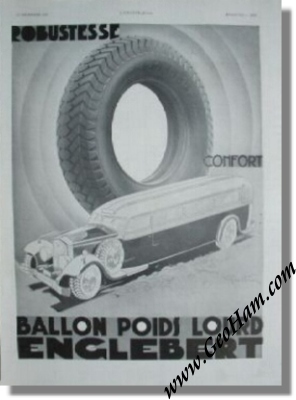 Vintage 1933 Englebert Truck Tires Advertisement by Geo Ham. Appeared in various French magazines in 1933. 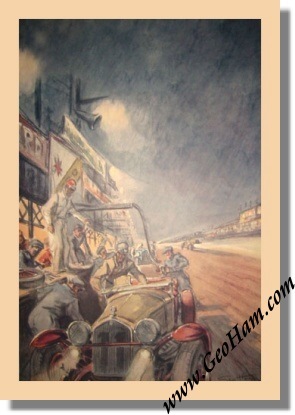 1933 Le Mans Illustration by Geo Ham. 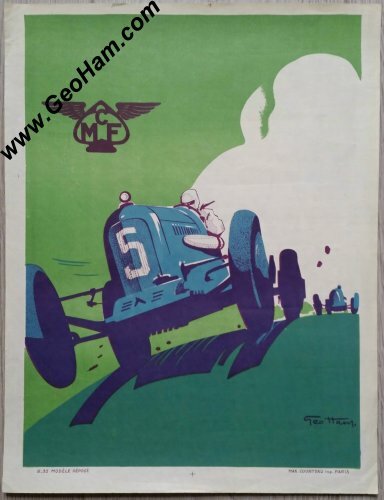 This illustration was made by Geo Ham as cover art for French magazin L'Illustration and depicts a pits scene of Tazio Nuvolari and Raymond Sommer en route to victory in the 1933 running of the Le Mans 24 Hours in their Alfa Romeo 8C 2300 MM. 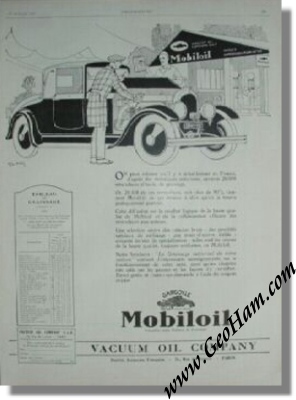 Vintage 1934 Shell Oil Advertisment by Geo Ham. Appeared in various French magazines in 1934. 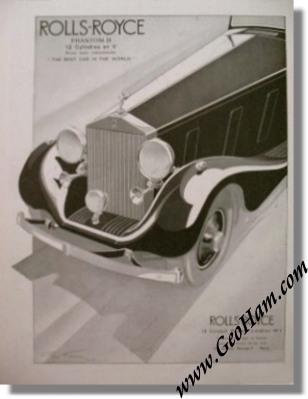 Vintage 1935 Rolls-Royce Phantom III Advertisment by Geo Ham. Appeared in various French magazines in 1935. 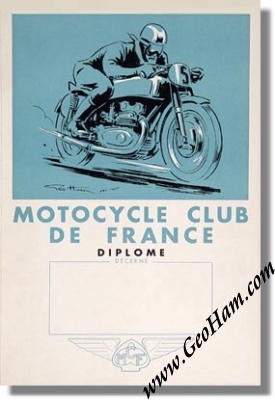 Vintage Original 1935 Motocycle Club de France Diplome Geo Ham Litho. 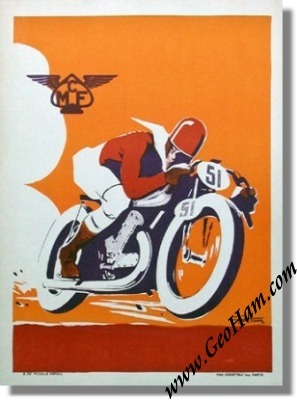 Vintage original litho, blank, designed by Geo Ham for the "Moto Club de France" and printed in 1935. Measures some 32.5 x 50 cm or 13 x 20 inches. 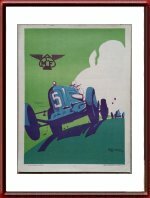 Vintage Original 1935 MCF Car Poster by Geo Ham Litho. 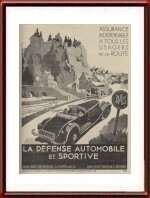 Vintage original lithograph, designed by Geo Ham for the "Motocycle Club de France" and printed in 1935. This is a somewhat lesser know example from this series and shows typical 1930's racing cars in shades of green and blue. 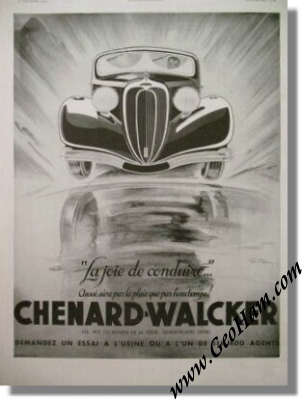 Vintage 1936 Chenard et Walker Advertisment by Geo Ham. 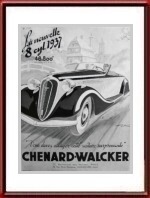 Art Deco Advertisment for the 1936 Chenard & Walker 8 Cylinder. Appeared in various French magazines in 1936. 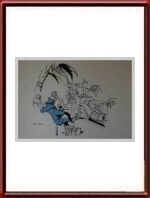 Measures approximately 10.8 x 14.8 inches. 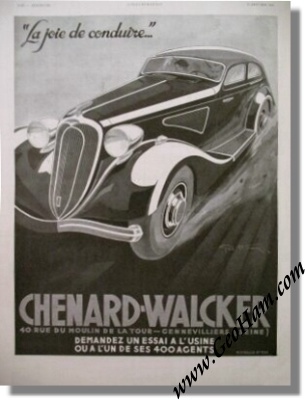 Art Deco Advertisment for the 1937 Chenard & Walker 8 Cylinder. 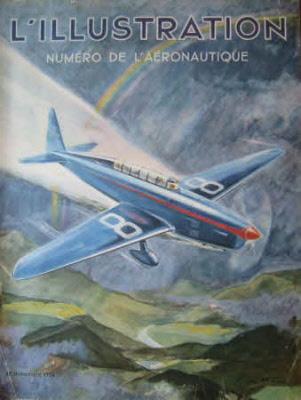 Appeared in various French magazines in 1937. 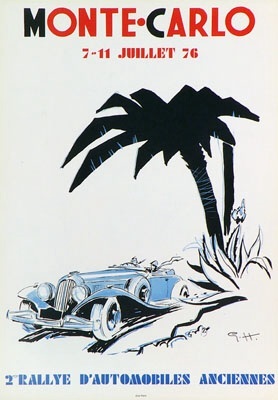 1937 Art Deco Advertisment for DAS. 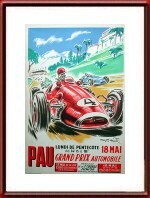 Vintage 1940's Geo Ham Simca Cinq Tour de France Litho. 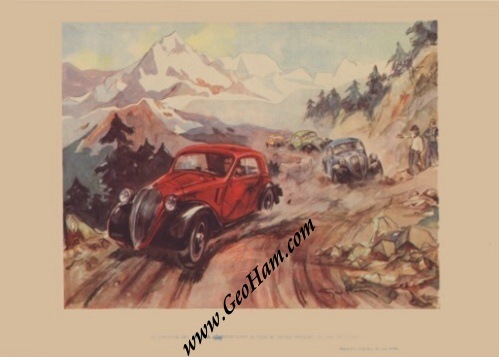 This vintage 1940's Geo Ham litho shows the caravan of Simca 5's during their climb up the Col des Alpes in the Tour de France (Auto). The litho measures some 33 x 22 cm or 12 x 9 inches while the image itself measures some 9 x 7 inches. 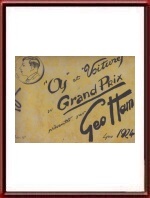 The original aquarel was made by world renowned automotive artist Geo Ham (Georges Hamel). 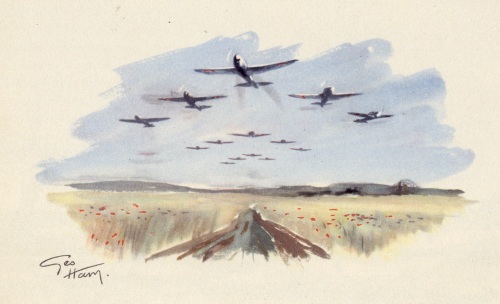 1949 Illustration from the Rene Chambre book about the French WWI fighter pilot & Ace Georges Guynemer. 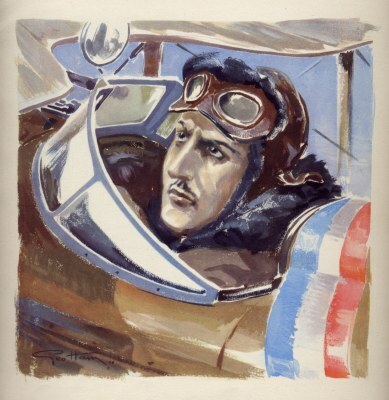 It shows a portrait of Guynemer in his cockpit. 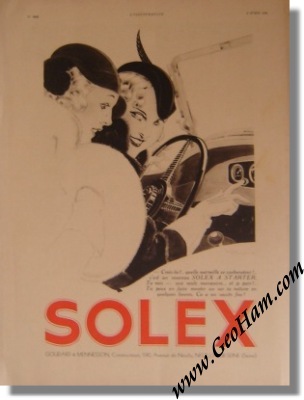 Published in 1949 by Editions Marcus, Paris, France. We salvaged this print from a copy of this rare book which was beyond restoration but the prints are in excellent condition. It measures approximately 22 x 22 cm or 9 x 9 inches. 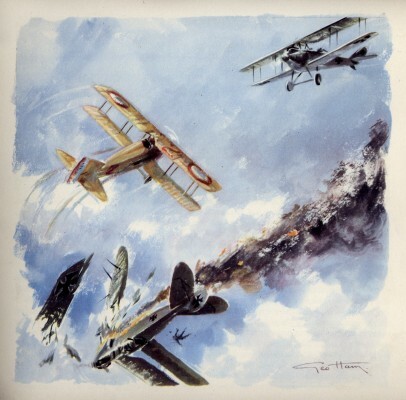 It shows Guynemer's plane flying away after he had just shot down a German bi-plane. It measures approximately 22 x 11 cm or 9 x 4.5 inches. 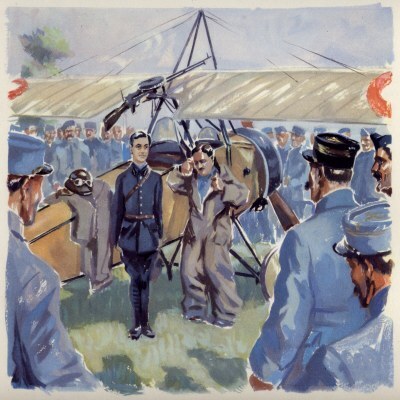 It shows Guynemer and his co-pilot being honored by their comrades after their first kill. 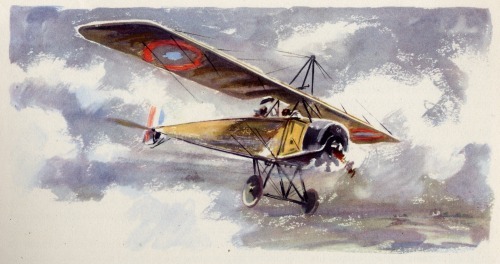 It shows Guynemer and his co-pilot in their monoplane. 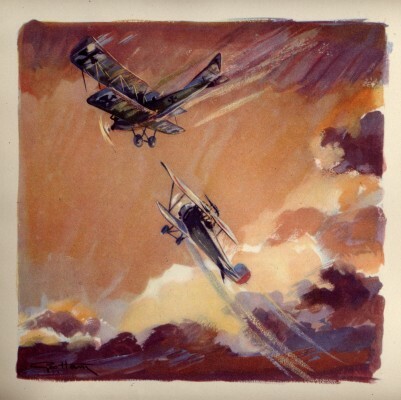 It shows Guynemer and his co-pilot enginging into combat with a German bi-plane. It shows Guynemer taking off in an (experimental?) monoplane. 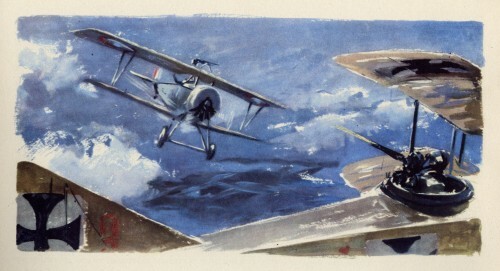 It shows Guynemer engaging into combat. 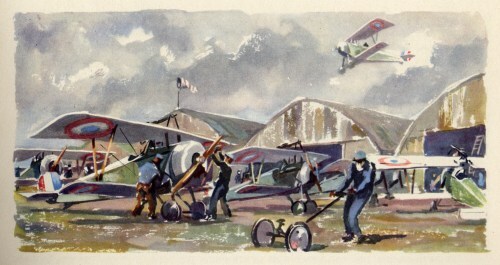 It shows a WWI French airfield scene. 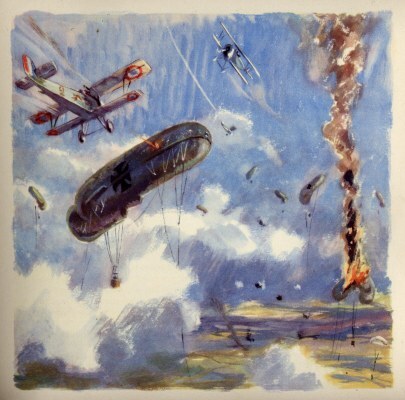 It shows an air combat scene with various planes and zeppelins. 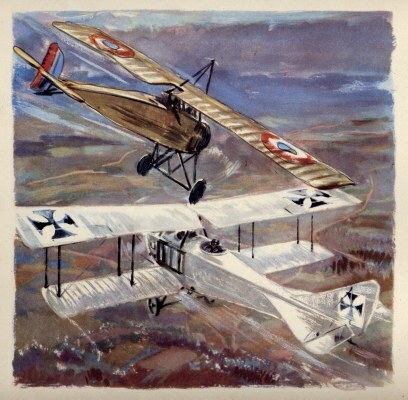 It shows Guynemer attacking a German Bi-Plane. 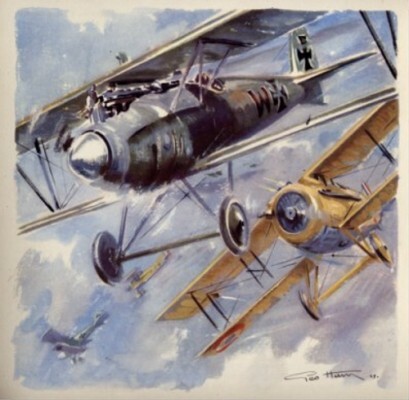 It shows Guynemer in his bi-plane, attacking a German bi-plane. 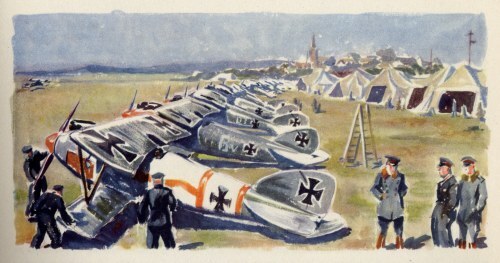 It shows a WWI German airfield scene. 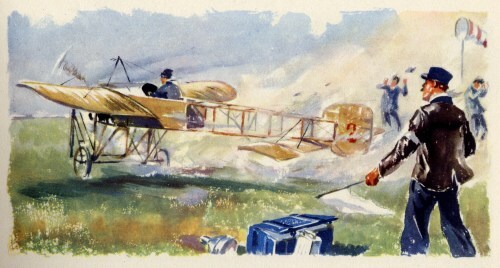 It shows Guynemer in his bi-plane in combat with German bi-planes of which one has just been shot down. 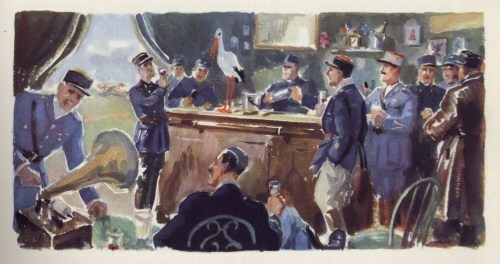 It shows a WWI French Aviation Officer's Mess Scene. 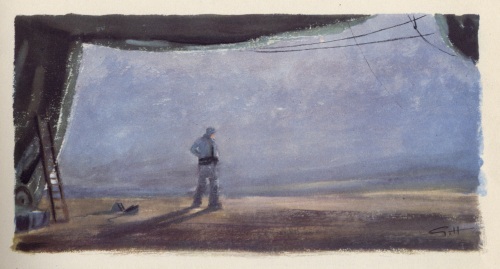 It shows Georges Guynemer in a pensive mood at a French WWI Airfield the evening before he was shot down and killed. 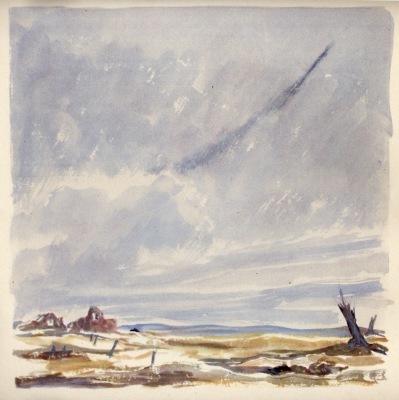 It shows the deserted battlefield of Poelekerke (Belgium) where Georges Guynemer apparently was killed. The truth was never revealed as his body was never recovered. It shows a Frenche arial salute for the fallen French Ace, George Guynemer, very impressive! It measures approximately 16 x 10 cm or 6 x 4 inches. 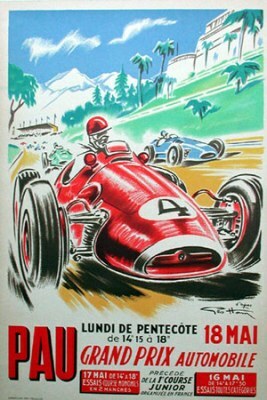 Original poster for the Grand Prix Automobile at Pau race track. Measures approximately 30 x 46 inches. 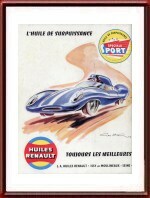 1953 Grand Prix de L'ACF - Reims Flyer Cover. 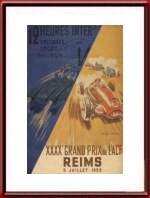 Issued for the XXXXth Grand Prix de L'ACF, Reims, July 5, 1953. 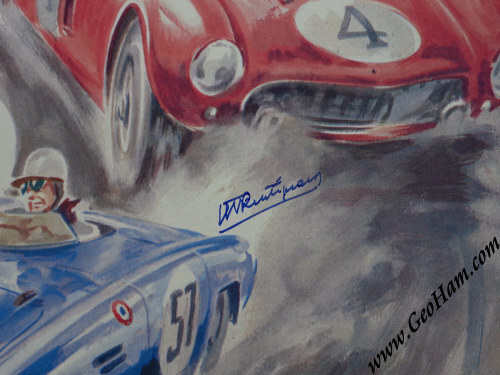 Maurice Trintignant signed Geo Ham print, Ferrari 375 Plus, Le Mans 1954. 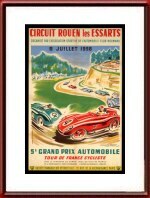 This is a GORGEOUS Geo Ham print of the Ferrari 375 Plus of Maurice Trintignant and Jose Froilan Gonzales en route to their victory in the 1954 24 Hours of Le Mans. 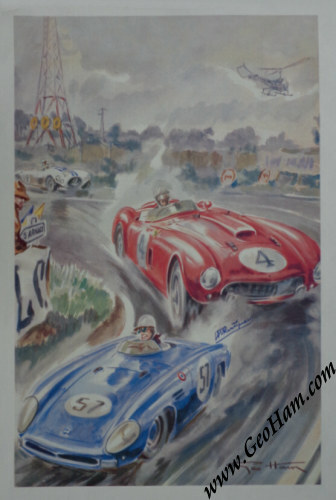 The scene depicted shows the car at Mulsanne corner with the the DB HBR - Panhard of Rene Bonnet and Elie Bayol in front of it and the # 1 Cunningham C4-R Chrysler of Biggs Cunningham and John Gordon Bennet right behind it. The print has been signed by Maurice Trintignant. It measures some 58 x 78 cm (+ border as shown in the picture) or 23 x 31 inches. The race was won by Jose Froilan Gonzales and Maurice Trintignant in their Ferrari 375 Plus with a total of 302 laps to their name. 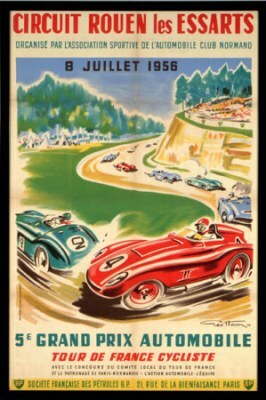 For the full results of this race, please see 24 Heures du Mans results 1954. 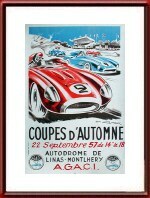 Original poster for the Grand Prix Automobile at Rouen Les Essarts race track. 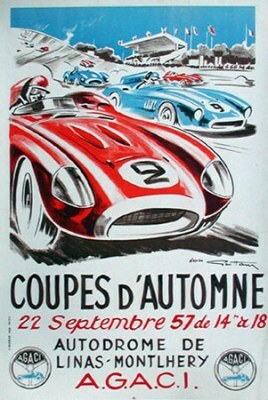 Original poster for the Coupe d'Automne at Montlhery-Linas race track. Measures approximately 17 x 24.5 inches. 1958 Advertisment for Huiles Renault. 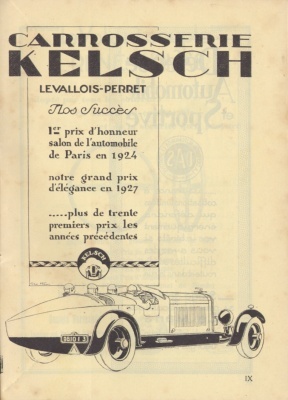 Appeared on the back cover of the program booklet for the 1958 edition of the Le Mans 24 Hours. 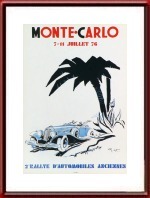 Original poster for the 1976 2nd Rallye d'Automobiles Anciennes de Monte Carlo. Released after the artist's death. 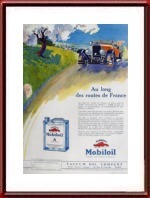 Measures approximately 18 x 25.75 inches.